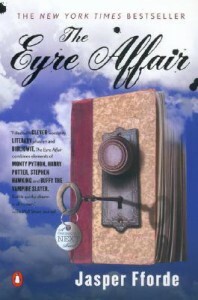 The Eyre Affair is a type of book that is interesting to have read, but not interesting while you are reading it. That is, the concept and idea was much more appealing to me than the actual book. And that was a surprising disappointment to me, given that I'm a big fan of clever twists on literature and complex plots. It's not that The Eyre Affair isn't good, it's just not great or even very good, and I had expected something more given the critical praise and market success. In some ways, The Eyre Affair just isn't sure what it wants to be--a thriller or a comedy--and so it tries to straddle both worlds (a meta commentary on its plot itself) and is unable to do either well. Since the plot is most of the pleasure of the novel, it would be a grave disservice to go into much of it here, and in any case it is too convoluted to retrace. 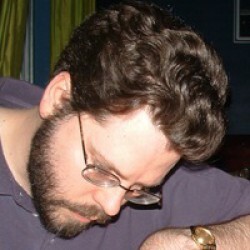 The basic premise, however, is that in an alternative England (one in which they still fight a war over the Crimea with the Russians and Wales has formed an independent republic) there are several groups of special operatives who guard against a number of problems: the ChronoGuard for rents in time, the terrorist police, the art crime squad, and the literary detectives, who guard against forgery and false information. Thursday Next is a LiteraTec who finds herself, due to an impressive batch of coincidences, protecting classic English novels from rewriting due to an invention by her uncle from the nefarious schemes of her former University professor. In the hands of a different author (say, Douglas Adams, who plowed increasingly close to this terrain in his Dirk Gently novels), this improbable plot would have been secondary to the humor potential revealed by the weakening of the lines between fiction and "reality." Fforde instead writes most of the book as a straight adventure/thriller, focusing on the roller coaster to whisk the reader past the plot holes and onto the next chapter. It is, in short, the perfect adventure film novel, with special effects galore and enough cheap laughs to lighten up the parts where things aren't being sucked up into a black hole, shot at, or blown up. "...made glorious summer by this son of York," continued Richard, limping to the side of the stage. On the word "summer" six hundred people placed sunglasses on and looked up at an imaginary sun. "...and all the clouds that lower'd upon our house in the deep bosom of the ocean, bured..."
"When were our brows bound?" yelled the audience. "...to the lascivious pleasing of a lute..." continued Richard, saying "lute" loudly as several other members of the audience gave alternative suggestions. "Piano!" shouted out one person near us. "Bagpipes!" said another. Somone at the back, missing the cue entirely, shouted in a high voice "Euphonium!" halfway through the next line and was drowned out when the audience yelled: "Pick a card!" as Richard told them that he "was not shaped for sportive tricks..."
It's one of those cases where the joke is more amusing in the contemplation than in the performance (as, for example, most of the latter day Saturday Night Live skits), and not only does it go on for too long, it doesn't even add to the plot or the characters. It is supposed to give a glimpse into this alternative England, where literature has supplanted sport as something people are obsessively passionate about. Even as a book geek, I squirmed at Fforde's portrayal of such a society, because it seemed that he lost all sense of why people are actually fanatic (be it sports or literature) in his desire to reverse roles. The fact that this all occurs as the background to the shoot-'em-up plot robs it of both its pathos potential as well as any possible critical social commentary. Other reviewers (such as the cover blurbs from The Wall Street Journal and The New York Times) compare this book to Monty Python, Buffy the Vampire Slayer and Bridget Jones, and by so doing reveals just how clueless the reviewers are about how and why each of those work. Python succeeds because the troupe did not require themselves to be linear and have a structure, but instead to let the joke trump all and move on to the next joke while the audience is still laughing. Buffy works because, underneath the monster-of-the-week plots and special effects, Josh Whedon is poking a sharp stick at both gender and genre stereotypes. And Bridget Jones, for her diary's sake, is as much a Horatio Alger story as it is a comedy, with a protagonist that her readers can empathize with if not directly relate to. Fforde's novel does none of these: Thursday Next is too efficient (like her screen forefathers played by Shwarzenegger or Stallone) to be a reader stand-in, the social commentary has no bite, and the comedy is forced and prolonged.